Russian general cargo ship Omskiy 99 collided with freighter Boris Pevkin at Taganrog Bay in the northeastern arm of the Sea of Azov. The both vessels were proceeding on parallel courses on the recommended route No 31, when the Russian cargo vessel suddenly changed course to starboard and stuck into the aft part of Boris Pevkin. The both ships suffered minor damages after the collision, as Omskiy 99 has minor damage to the bulwark, while the other freighter has damaged layers in the portboard. There were no reported injuries and environment pollution and the both vessels were released to resume their voyages without inspection and special survey. The local authorities initiated investigation for the root cause of the accident. It was estimated that the Russian general cargo ship Omskiy 99 changed course due to failure of the gyrocompass. The technical problem was fixed and the ship resumed the voyage to Turkey. The general cargo ship Omskiy 99 (IMO: 8943399) has overall length of 108.40 m, moulded beam of 15.00 m and maximum draft of 4.00 m. The deadweight of the freighter is 3,108 DWT and the gross tonnage is 2,463 GRT. The ship was built in 1979 by Navol Olienita in Romania. The general cargo ship Omskiy 99 is operating under the flag of Russia and managed by local company Marcion. The freighter Boris Pevkin (IMO: 8971188) has overall length of 138.30 m, moulded beam of 16.70 m and maximum draft of 4.50 m. The vessel has deadweight of 5,446 DWT and gross tonnage of 4,997 GRT. The cargo ship was built in 1989 by Oka Shipyard in Russia. The vessel is operating under the flag of Comoros Islands and managed by Osternases Industres. 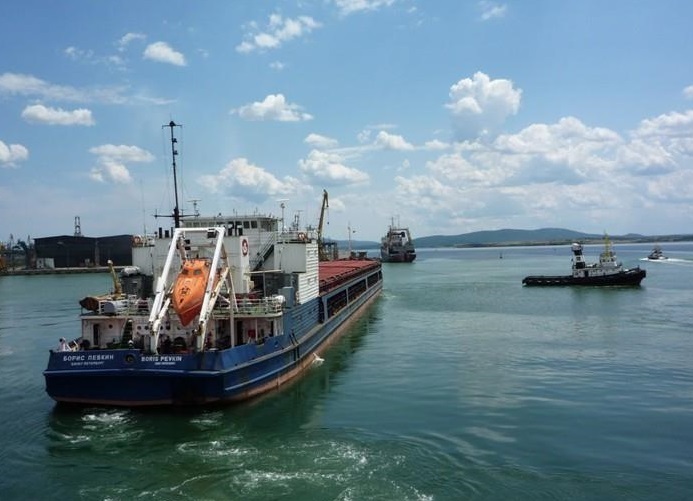 During the accident, the ship was en route from Rostov to Icdas, Turkey.